Description: Henry Aldridge and Son, the worlds leading auctioneers of Titanic memorabilia are holding an auction of Titanic collectables to commemorate the 100th anniversary of the completion of the Royal Mail Steamer Titanic on March 31st 2012. The sale will be 100 years to the day after Titanic was finished at Harland and Wolff. RMS Titanic left Belfast on April 2nd 1912, the start of a journey, which ended in tragedy in the cold North Atlantic on April 14th 1912 with the loss of over 1500 lives. 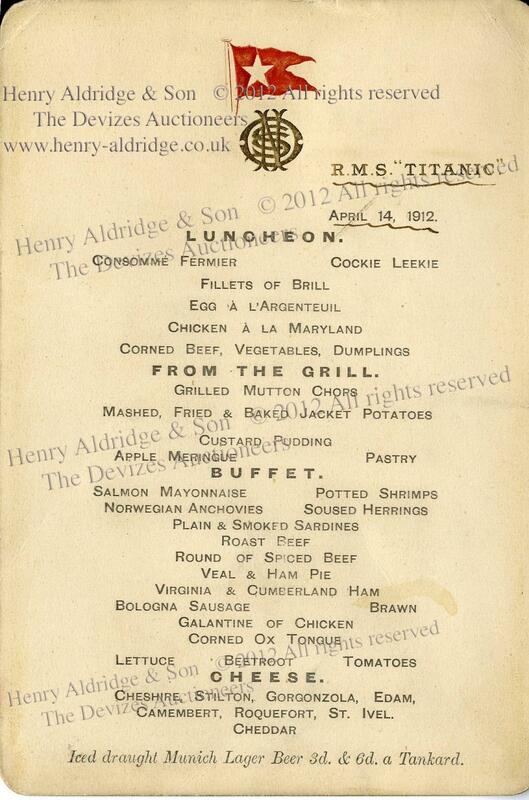 carries the all-important date of April 14th and gives the reader a fascinating insight into the culinary life of Titanic’s elite passengers.